In an indication that cut-offs for First Year Junior College could see an upward trend, the first merit list for Christian minority students at St Xavier’s College, Fort, increased by over 3% in both the arts and the science streams. Other colleges, which are scheduled to announce their minority merit lists, too are expecting higher cut-offs. The general merit list will be announced on July 5. The first merit list for minority students at St Xavier’s, announced on Wednesday, ended at 80.8% in the science stream and 86.2% in the arts stream. In 2017, the first cut-offs were 76.8% and 83.2% in the science and arts stream. The cut-offs at the college last year were the lowest in five years. This year, most city schools, across boards, saw a higher number of students scoring above 90% in Class X and that could lead to higher cut-offs, feel principals. “We are announcing our minority merit list on Thursday but like in degree colleges, we are expecting an increase of at least 2-3% across streams for FYJC as well,” said Rajpal Hande, principal, Mithibai College, Vile Parle. Though the number of high scorers went up this year, the top scores were lower. The top score on St Xavier’s arts merit list for Christian minority students went down from 98% last year to 97.2% this year. For science too, the top-most score on the list was 95% as opposed to 97% last year. This year, the state board reduced the additional marks to students participating and excelling in arts and culture from 25 to 15 and that impacted the results. Nevertheless, the top student on the arts list was from the state board and another two were in the top five. A student each from ICSE and CBSE made it to the first five. But a Kerala state board student topped the science list. There were two each from CBSE and SSC in the top five. St. Andrew’s College, Bandra, which announced two merit lists for Christian minority students, however, saw a 3-4% drop across streams. “We announced our second list on Wednesday but the difference between the first and the second list is marginal. 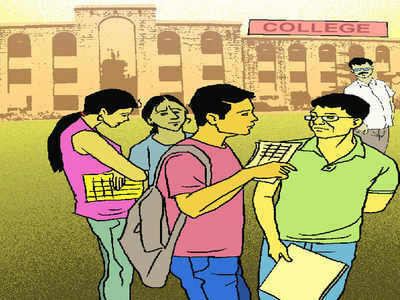 A lot of students haven’t confirmed admissions as they are waiting for merit lists at other colleges,” said Marie Fernandes, principal, St Andrew’s College, Bandra. Principals feel the arts cut-off could see an increase. “Seeing the flow of applications, humanities seems to be a popular choice. We are receiving a lot of applications for arts and most are from high-scorers,” said Ashok Wadia, principal, Jai Hind College, Churchgate. The college has walk-in admissions for Sindhi students.